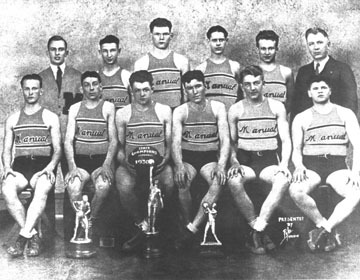 The 1929-30 Manual High School basketball team was one of the finest in Peoria history, winning the state title under Coach Telfer Mead in his first year at the helm. The team was led by Neve Harms, Benny Schwartz, Harvey Benson, Charles Wolgemuth, Ken Shoup and Robert Clauss and posted a 15-3 record prior to tournament play. Manual then swept past Princeville, Kingman, Roanoke and Peoria Central in District play and soundly defeated Swaney, Canton and Seneca in the sectional played at the Peoria Armory. Manual then dominated the state tournament in Champaign, defeating Atwood, Beardstown and Bloomington 38-25 in the state title game. Wolgemuth led the team in scoring at the state tournament with 30 points, while Clauss was close behind with 27. Harms, a brilliant four-sport athlete, scored 20 points in Champaign. 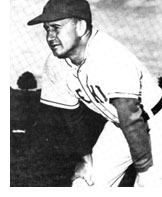 Other key members of the title team were Joe Blotner, Albert Mitzelfelt, Charles Reece and William Ritchie.